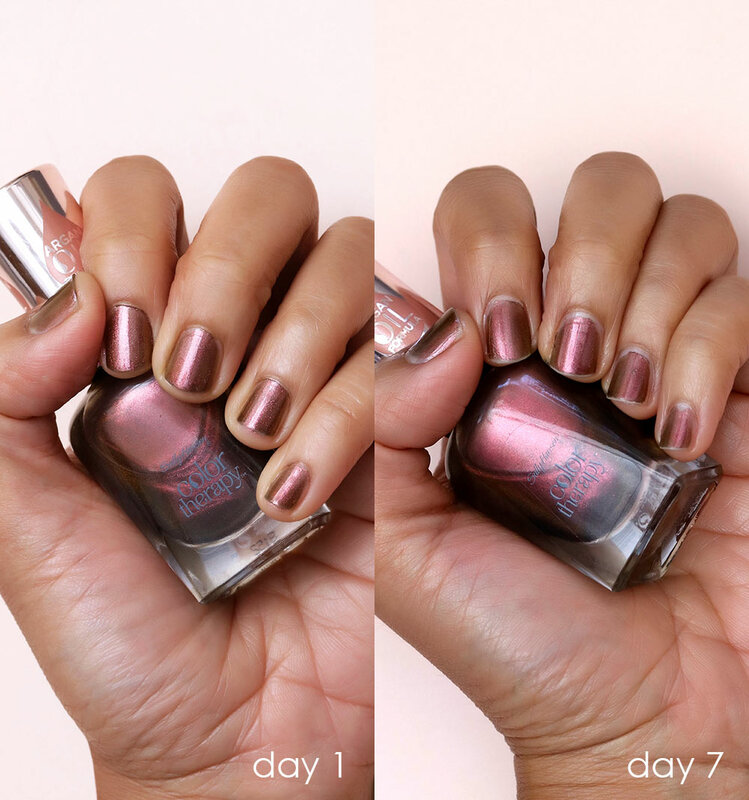 In the Desperately Seeking Persistent Polish series, I wear a different nail polish for seven days, and take before and after pics to document the condition of my paws over the course of the week! I keep thinking that I’m going to run into a dud one of these days from Sally Hansen Color Therapy, because, hello! — when do you EVER find a nail polish line where every. single. polish. you try consistently delivers the goods? This week was definitely NOT that week, because Bronze Reflection was one of the best-performing shades I’ve tried from Color Therapy so far. I feel like I say that every week about Color Therapy these days (hey, Karen broken record much? ), but when something’s worth raving about, I’m gonna rave about it! 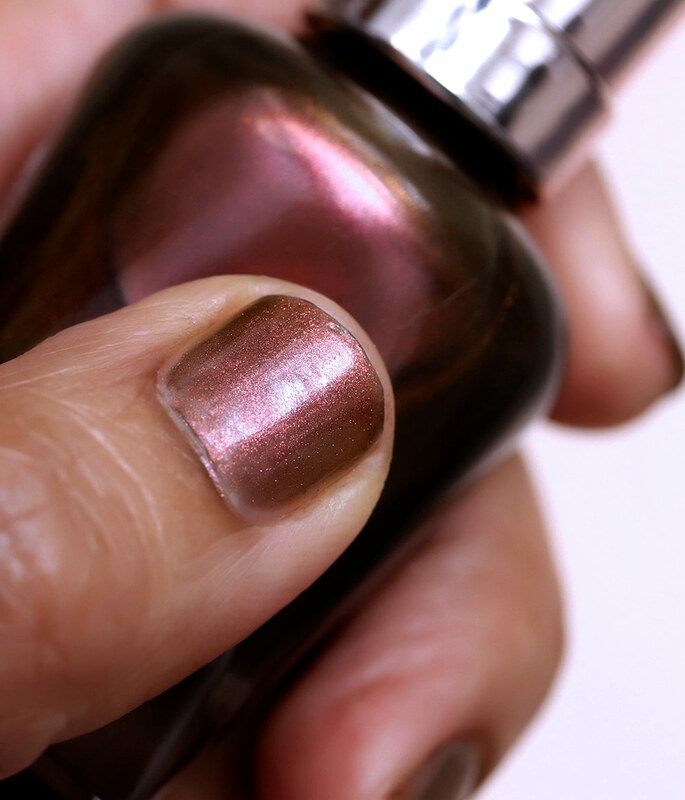 Bronze Reflection, which lists for $7.99, is all the things I’d expect to find in a Chanel cult nail color (except for price, of course). It has finer-than-fine micro-glitter, and it’s startlingly complex. Just like *that*, it shifts from pinkish bronze to a cranberry tinged with rose gold to a buttery yellow brass. It’s like all of the colors of autumn leaves squeezed into a bottle. And to top it off, you can wear it sheer — and it’ll look purposefully sheer, and not patchy or poorly pigmented — or you can go completely opaque like I did in these pics. It’s SO flexible. I wore it with two coats of the same Smith & Cult Base Coat and Top Coat I’ve been using with all of the polishes in the 7 Days series. Technically, I wore this mani for eight full days this time. Bronze Reflection is a beast! Oh, and after a two-month exercise hiatus (Connor started preschool, and at least one person in our little family has been sick at any given moment the entire time, no joke! ), I was finally well enough to get back in the gym this week, and I had Bronze Reflection on my nails. It was so durable that it lasted through three brutal HIIT sessions with free weights, pull-ups, triceps dips with Equalizer bars, and ungodly amounts of burpies and push-ups. It’s truly amazing 1) how quickly one falls out of shape, and 2) how brutal gym equipment is on your mani. This line is SO good, you guys.